Here’s a secret: today is July 3. Nothing happens in the mass media without people carefully planning it (unless you’re caught hiking the Apalachian Trail in Argentina). So Sarah Palin’s announcement today that she was calling it quits as governor of Alaska was timed carefully for a huge impact in the media. What gives? First, let’s look at the date. July 3 is the last real news day before a long U.S. holiday weekend. This means in the United States news that breaks today will reverberate without distraction over a quiet weekend of car traffic and barbecues. Announce something on the 3rd, people will remember it, and there will be a pronounced pause before reporters or analysts can chase you down for a critical response. Second, let’s look at the message. Sarah Palin is resigning from the governorship of Alaska for efficiency, to avoid lame-duck wastefulness, to not be like other governors, to free herself up for other forms of service. It’s pretty clear that people in Alaska will be upset and viewers in the other 49 states are intrigued. Palin has just launched herself into a national political spotlight. Third, let’s look at the controversy. Yes, it’s unusual to back out of an elected post. 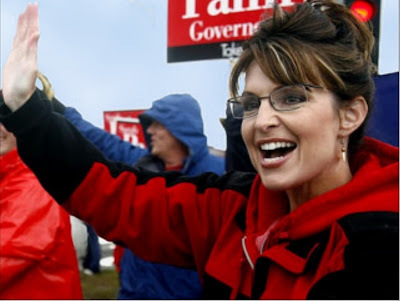 But if Palin were to begin a bid for the 2012 presidential election with paid advertising, it would cost her more than $3-$5 million to run ads in one day in all the major U.S. dailies and broadcast networks for an official campaign launch. Instead, with one press statement, she’s achieved more than that in free publicity. If the goal is to make an impression, Sarah has succeeded wildly. People are listening, they are attuned, they are wondering what message will come next. Liberals are secretly grousing, hearing a bold message on hold, the holiday here, little chance to dig in for a retort. Conservatives are rejoicing — we’re in the headlines, she’s doing something big, what will come next? Whatever one’s politics, all we can say is well played, Mrs. Palin, well played. We’ve watched this Palin interview twice and still have no idea what the governor is saying — because we’re mesmerized by the turkey having its head chopped off in the background. Seriously. Try to listen without wondering when the dude back there is going to finish his business. Reminds us of planning meetings where marketing managers carefully craft messages without thought of the context, competitors or market trends. What else are your customers hearing? Will you make any sense when they look over your shoulder and see something else?